Minister for Rural and Community Development, Michael Ring, last Friday officially opened the Belcarra Community Playground, Riverside Walk and Biodiversity Trail. These projects were funded as part of the CLAR Programme and the Community Enhancement Programme run by Minister Ring’s Department. Last year, Minister Ring allocated €50,000 in funding for the construction of the Belcarra playground under his Department’s CLÁR Programme. This went towards the playground equipment and the associated groundworks. 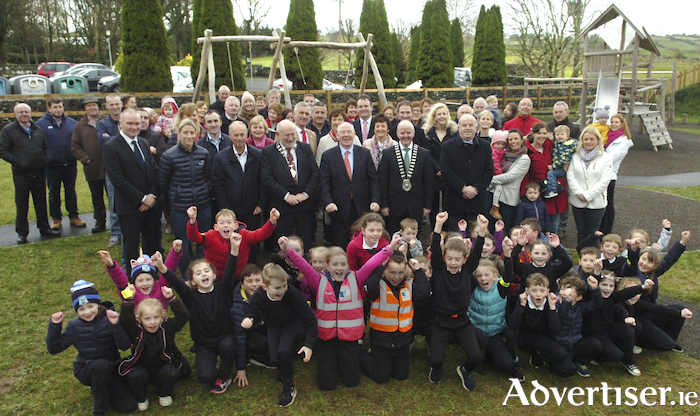 Mayo County Council contributed €26,000 and the local community contributed a further €4,000 towards the playground. Earlier this year, Minister Ring allocated €400,000 to Mayo under the Community Enhancement Programme. Of this amount, €5,300 has been used to develop the Riverside Walk and Biodiversity Trail which is now a valuable natural amenity for the public. Speaking at the opening, Minister Ring stated: "The new playground and the riverside walk will bring significant benefits to visitors and to the community in Belcarra and surrounding areas. "The playground will serve as a great enticement to attract families to the locality and increase the potential of the area, making it more attractive to prospective homeowners which would counteract population decline. It will benefit young children and their parents from Belcarra and beyond for years to come. "As Minister for Rural and Community Development, I believe this represents an excellent return on the investment made by the Government. Last year, Mayo received funding of €879,882 under my Department’s CLÁR Programme and it’s great to see this funding being brought to fruition to the benefit of local communities such as Belcarra. "I want to congratulate all those who have been involved in developing this playground. I believe that playgrounds and play areas represent a great use of public money. Communities get so much use out of them and they keep our children happy and healthy.